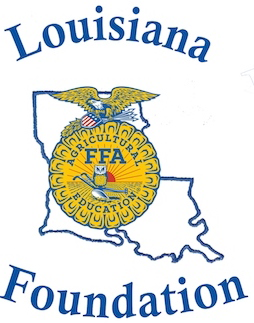 The Louisiana FFA Foundation is a 100% tax-deductible, 501(c)(3) non-profit foundation which was founded in 1981 for the purpose of supporting the activities of the Louisiana FFA Association. The Foundation creates partnerships to help fund student activities, awards, and scholarships at the regional, state, and national levels. Throughout the year, Louisiana FFA hosts several educational and leadership events pertaining to the agriculture industry. The experiences received through FFA and agriculture class prepare students for a wide range of careers in the areas of science, technology, business, leadership and skilled labor. When you partner with the Louisiana FFA Foundation, you are investing in the future of agriculture and the students of today who will be our agriculture-industry leaders tomorrow. The Louisiana FFA Association is a dynamic youth organization that changes lives and prepares students for premier leadership, personal growth and career success through agricultural education. An example of what works well in education, FFA is an intra-curricular organization that implements the three-circle model of education – classroom instruction, hands-on learning and leadership development through FFA programs. The world’s population continues to grow, and the agriculture industry needs more people who can help produce food, fuel and fiber in ways that are faster, smarter and more sustainable than ever before. By giving to the Louisiana FFA Foundation, you are helping to train agriculture education students to become the leaders we need for tomorrow — leaders who will develop the new strategies and technologies that will ensure a safe, abundant and affordable food supply for all of us. Louisiana FFA’s mission is to make a positive difference in the lives of students by developing their potential for premier leadership, personal growth, and career success through agricultural education. Our success in achieving this mission depends heavily upon the support we receive from our annual partners. Thank you for your support of Agriculture Education, the Louisiana FFA Association, and outstanding leaders for the future!